A note from the publisher: We would like to introduce our first guest contributor, Lauren Pritchett. Lauren is a native of the Triangle area and attended NC State University. She currently lives in Raleigh’s Cameron Park neighborhood with her husband and their dog, Quailford. Aside from blogging about life in Raleigh, Lauren works as an account manager for a web marketing firm. Storytelling is vital to historic preservation in our community. We can put forth all of the money and effort to keep a structure sound, but without the avid storytellers, these structures would not hold the time-tested significance that they deserve. That’s one of the reasons that I, like so many of my Raleigh neighbors, am so fond of Goodnight Raleigh. The Goodnight Raleigh community brings awareness to our city’s fascinating past, which makes us more thoughtful when planning for the future. This weekend, May 3-4, for the first time in Raleigh, Jane’s Walk is offering another venue to foster open communication about our city’s development. Jane’s Walk is a worldwide event celebrating urban activist Jane Jacobs’ birthday and consists of locally led walking tours advocating citizenry. As a proponent for Raleigh’s historic preservation, and inspired by stories like the ones I’ve read on this blog, I felt compelled to facilitate a walking tour for Jane’s Walk. I invite you to join me on the DTR History of Commerce Tour to discuss downtown’s historic commercial architecture as part of Jane’s Walk. We’ll walk and talk about the importance of incorporating historic preservation into our city’s development plan. Above is the historic G&S Department Store during restoration by Empire Properties four years ago. 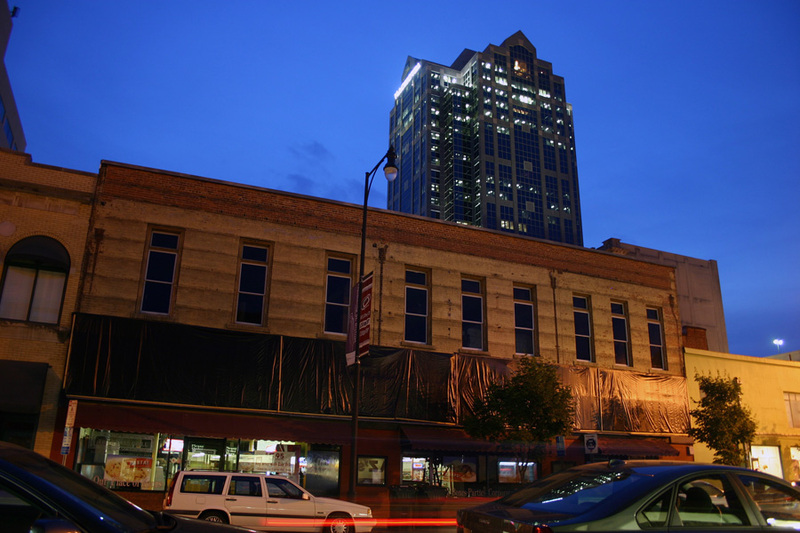 The architecture of downtown’s commercial buildings tells the story of Raleigh’s economy and culture. When we take notice of our concrete jungle, a dynamic timeline of our progress comes alive right before our eyes. The Raleigh Furniture Co. Building, for example, represents an era when E. Hargett Street served as the commercial hub of the African American community, charged with thriving businesses and visited by many notable artists, including Duke Ellington! 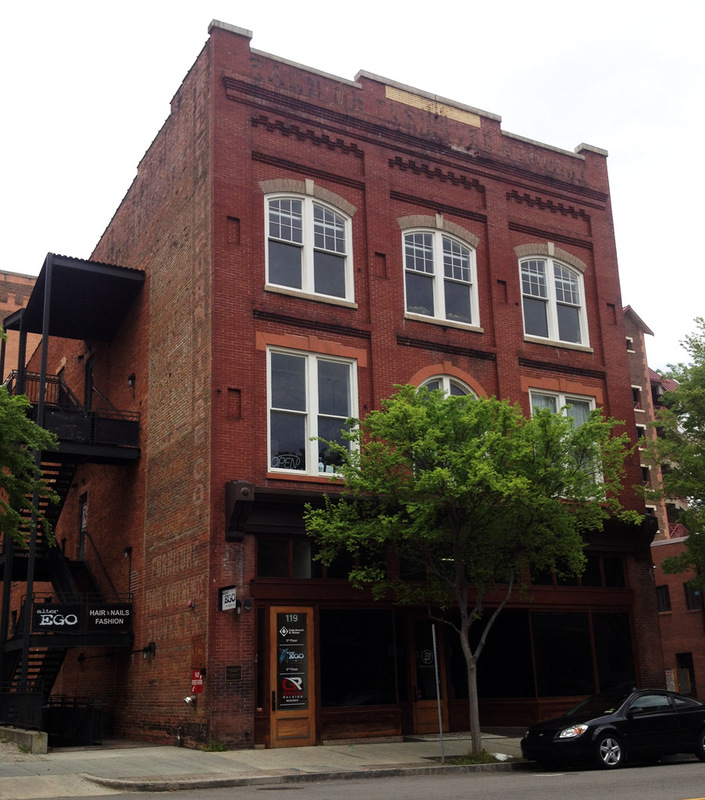 The Raleigh Furniture Co. building, erected in 1914 on E. Hargett St., was recently restored by Empire Properties. 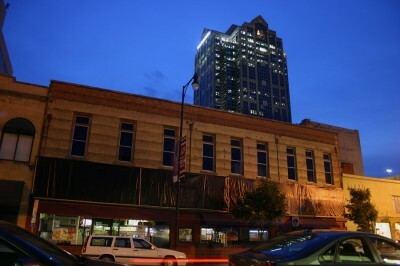 Just one block west of here, while many of us cherish it as Raleigh’s iconic watering hole, The Raleigh Times Building at 14 E. Hargett St., is also known for its connection to the city’s journalism culture. And a few blocks south, there are times that I almost hear the guffaws of politicians past and the clinking of crystal emitting from the Hotel Sir Walter (now the Sir Walter Raleigh Apartments), which remained an elite rendezvous for state lawmakers until the Legislative Building was erected in 1963. 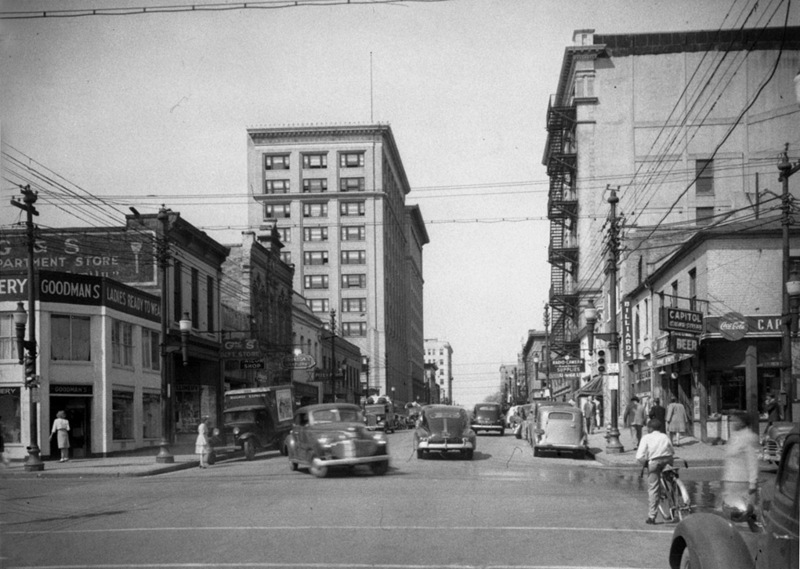 Those are just a few examples of the dozens of commercial landmarks in downtown Raleigh. Please join me on the DTR History of Commerce Tour as part of Jane’s Walk this Saturday, May 3 at 12 noon starting at the City of Raleigh (COR) Museum. I’ll go into more detail about 10 of the buildings we pass each day when going to work or meeting friends for coffee. But best of all, we’ll swap stories and have an open conversation about the well-being of Raleigh! Below is a list of the buildings to be visited this Saturday on Lauren’s DTR History of Commerce Tour. The links will take you to articles about these sites previously published by Goodnight Raleigh. Read up and learn all about Raleigh’s commercial heritage! Be sure to visit Lauren’s blog, Quailford, where you can read about additional downtown Raleigh Landmarks. The historic photo opening this article is courtesy of the State Archives of North Carolina.